You can learn about other products developed by TVPaint Développement : Mirage, CBPaint, the Deluxe 3D Titler, the Filter Pack, PIP 3D Studio and the Object tracer. 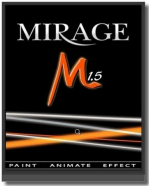 In 2003, Mirage was based upon version 7.0 of TVPaint's technology. The FX Stack was added to Mirage to allow the simultaneous application of multiple special effects (blurs, distortion effects...). Bauhaus Software was responsible for distributing Mirage until the distribution agreement ended in 2005. Although TVPaint Développement no longer sells nor supports Mirage (technical problems, incompatibility with Intel Macs, lost dongle, installer or code...) you can join the TVPaint community to ask your questions. If you're interested in upgrading Mirage, visit our webstore or contact us directly. During the year 2004, TVPaint Developpement signed a new partnership with MacroSystem. From this collaboration is born CBPaint, the first video paint addon based on the TVPaint Technology 7.2 for the Casablanca video system. This version is developed by TVPaint Developpement and sold by MacroSystem. Deluxe 3D Titler was designed to create 3D titles for videos produced with the Casablanca video system. More information on Deluxe 3D Titler can be found on MacroSystem's website. Pip Studio 3D was designed to apply 3D rotation effects to videos on the Casablanca video system. More information on Pip Studio 3D can be found on MacroSystem's website. More information on the Filter Pack can be found on MacroSystem's website. Tracer also allows for the addition of Picture-In-Picture effects. More information on the Object Tracer can be found on MacroSystem's website.